Oak trees (Quercus species) are susceptible to a variety of diseases and pests, like fungal infections and scales. When they are kept healthy, however, they are less vulnerable to problems and heal more easily. 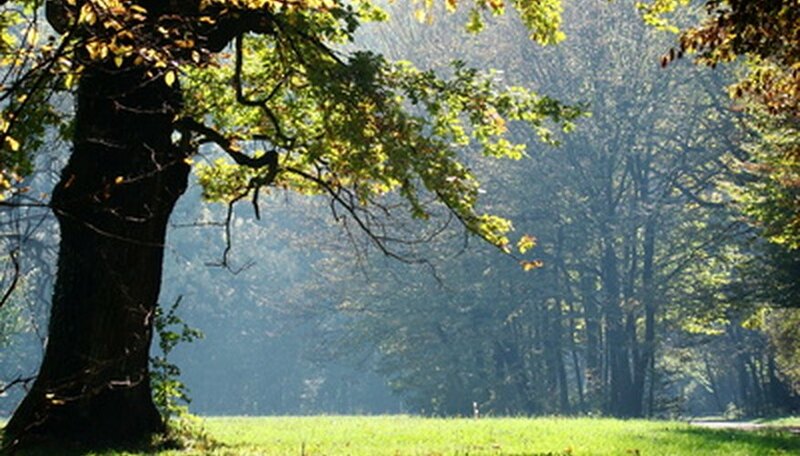 Oak trees generally prefer full sun to partial shade and moist, well-drained soil. Be sure to closely follow care requirements for your particular oak variety. Actinopelte leaf spot forms due to the fungus Tubakia dryina, sometimes referred to as Actinopelte dryina. Often occurring in moist weather conditions, this fungal infection generally attacks trees that already have diminished health. Symptoms include the presence of red/brown round spots on leaf surfaces with borders that may begin overlapping, resulting in larger discolored areas; spots initially measure approximately 1/4 to 1/2 inch in diameter. Trees may completely lose their leaves or may die in extreme cases, particularly with trees already in decline, explains the Clemson University Extension. For control, remove and destroy any infected fallen leaf parts. Apply a copper fungicide like mancozeb to the entire tree if infection has taken place for three or more simultaneous years. Mistletoe is a parasitic plant that steals water and food that the tree would otherwise use, leaving it diseased and malnourished. This parasite from the Phoradendron species causes defoliation on trees except for dense collections of leaves remaining on the ends of branches. Practice caution in the presence of mistletoe as the plant itself and the white berries it produces are toxic, explains the Clemson University Extension. For control, remove infected areas by "cutting out infected limbs 1 to 2 feet below the point of attachment." Additionally, you may need to apply ethephon, a chemical control, particularly in severe cases. Infestations of mites or insect pests on oak trees cause a response that leads to the formation of galls, which are abnormal areas of growth or swelling on different plant parts. Though galls usually only cause cosmetic damage, severe problems may lead to partial death or death of the entire tree if left untreated. For control, prune affected branches and remove and destroy affected fallen parts of the plant, suggests the Clemson University Extension. There are no chemical control recommendations for galls. Scale infestations of oak trees are comprised of parasitic insect pests that eat sap from foliage tissue. The release of "honeydew" (a sugar-like liquid) from particular scale varieties creates a prime environment on oak trees for a fungal infection called sooty mold. Symptoms of scale include the presence of the red-brown insects, defoliation, growth problems and leaf discoloration, according to the Clemson University Extension. For control, use both biological and chemical methods. Consider removing visible scales or destroying affected twigs when possible, as well as use of natural enemies like parasitic wasps. Control by chemicals is a challenge, but if necessary, apply insecticides, such as bifenthrin or malathion.